This easy chickpea salad is my vegan version of a classic tuna salad. It's tangy & light, made with Dijon mustard, crunchy celery & cornichons. I think there are 2 types of people in this world – those who love tuna salad and those who hate it. Because my mom made it all the time when I was growing up, I definitely fall into the first category. But today, I’m hoping to bridge the “hater” gap with these chickpea salad lettuce wraps. If you’re not into fishy things, no worries, these wraps are completely vegan. If you are into fishy things, I think you’ll love them just the same – mashed chickpeas combined with salty, briny flavors (i.e. good Dijon mustard, capers, and cornichons) and finished with crunchy celery and scallions recreate that tuna salad taste to me. 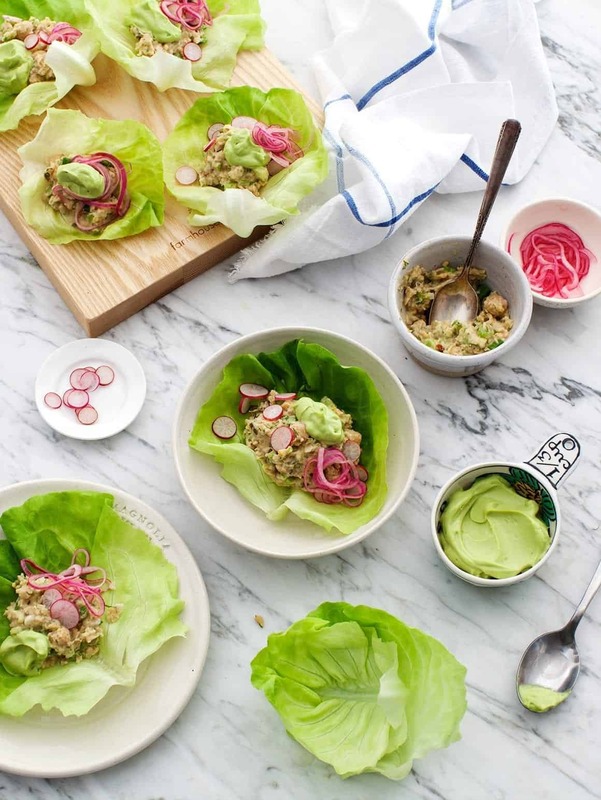 You could definitely make a great sandwich or mock-tuna melt out of this chickpea tuna salad, but since it’s spring, and we’re trying to eat lighter and brighter, I made lettuce wraps. To balance the bright and briny flavors of the chickpea salad, I made this creamy avocado dill sauce using Almond Breeze Almondmilk to whip it all together. 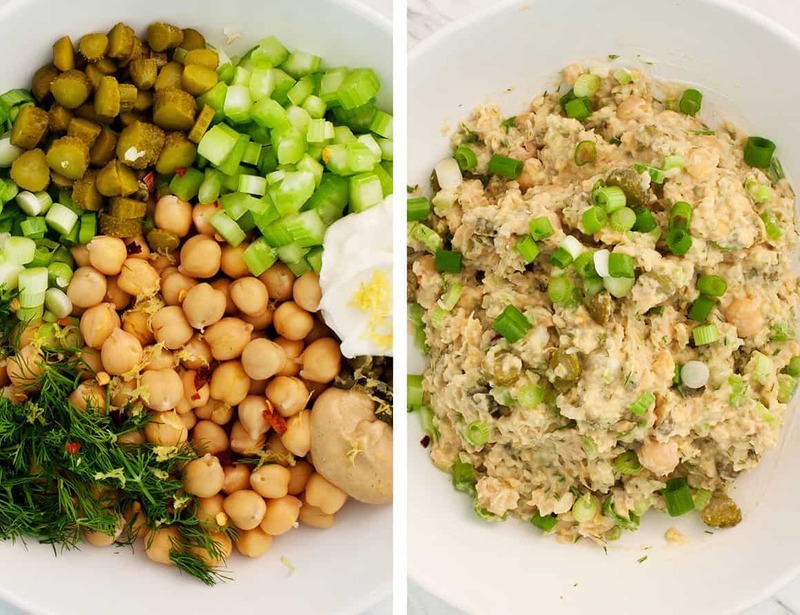 This chickpea tuna salad is a great lunch, especially if you make the components in advance – the dill sauce should last 2 to 3 days, and the chickpea salad will last a week. 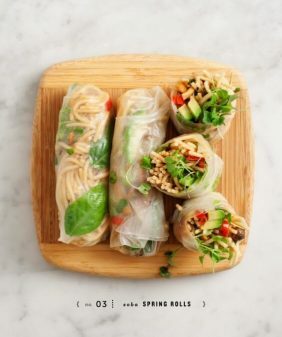 These wraps will also make a lovely Easter brunch appetizer for the same make-ahead reasons. Plus – how pretty and springy? The chickpea salad recipe below will make about 12 lettuce wraps with a little extra avocado dip. 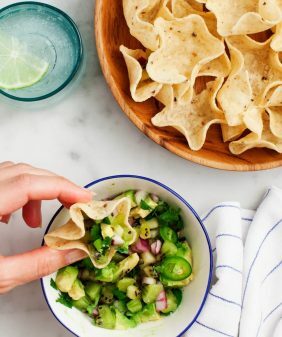 If you’re looking to use up the rest of the dip, I suggest you break out a bag of tortilla chips! Or, at the very least, slather it on a veggie sandwich the next day (#notasaddesklunch). It’s so luscious and delicious – I hope you enjoy it as much as we do! 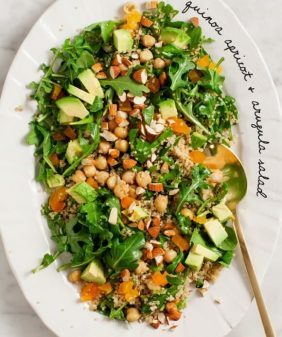 And if you’re as crazy about chickpeas as I am, try them in this summer salad, this spring salad, this kale salad, or as a salty, crunchy snack! This easy chickpea salad is a wonderful healthy vegan lunch! Modeled after a classic tuna salad, it's full of fresh herbs, crunchy celery & tangy cornichons. It will keep in the fridge for a week. I love salad wraps and this idea of making a chickpea salad here. We are always trying to come up with new ways to eat more veggies in leu of animal protein and will have to try this out sometime! This looks delicious! It would be great to make for a week’s worth of work lunches!! I made this today. I had never heard of cornichons and had to search for them at the grocery store. It was superb. We are going to use it as a sandwich filling as well. I have been on a roll making your recipes this past week. Last evening I served guests your roasted cauliflower soup, millet cakes with homemade pear chutney and a salad. It was the first time I made those recipes, everyone raved how good they were. Does anyone else do that? Serve guests a recipe you have never made before? You never let me down. Your sesame tahini soba noodles is wonderful. I was eating the sauce by the spoonful, so I made a double batch. We use it as a salad dressing as well, yummy. I have never left a comment to a blog until now, that is why I am commenting on several recipes. Thanks for all the work you put into these inspiring recipes. Hi Laurina – omg, thank you for leaving this wonderful feedback! I’m so glad you’ve been loving the recipes. It’s SO SO helpful to hear which ones have been favorites! These look yummy! 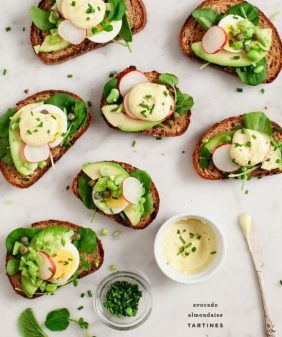 I can’t wait to make these for an appetizer form my Easter brunch. This looks great! Do you have a favorite type of vegan mayo you can recommend? 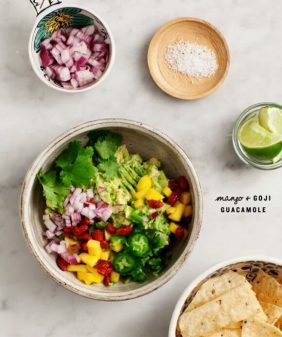 Canola, avocado, coconut, etc? Thanks! Hi Chloe, I like Sir Kensington’s Fabanaise. Avocados go so well with dill, this looks delicious. 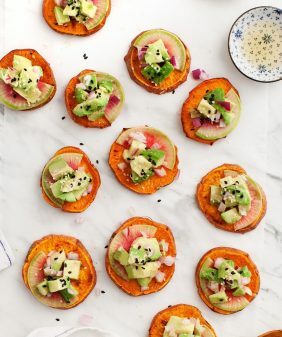 Those avocado tartines are sheer perfection. I’d love to serve that as a starter for any of my parties! This is amazing. Lots of dill and vinegar flavors but I am in love with it. I tried mine on a coconut wrap. I will be making this often. Thank you. Just curious how I might substitute dried dill in this recipe? use much less than fresh – I’d start with 1 teaspoon dried dill and taste from there. You can also just skip the dill if it’s the only ingredient you don’t have (I’d add a bit more salt in that case). Hope that helps! Hi! I used dried dill as I missed the farmers’ market this weekend. The chickpea salad is so easy to make! It’s chilling in my fridge as I type. Thank you for a great recipe. it might give it a funny sweet taste, I’m sorry, I think unsweetened is necessary. (If it were a baking recipe, I’d say either would be fine). You could also try using a few splashes of olive oil and a few splashes of water in place of the almond milk – just enough to get a saucy consistency. Hope that helps! This was seriously delicious, Jeanine! It’s similar to a salad I make but I love the extra brininess in yours with the capers and lemon zest. I also added finely diced apples since I had one on hand I needed to use. And topped the wraps with your pickled onions and sun dried cherry tomatoes. Will definitely be repeating this one!